When the secretary inquired yesterday what the subject of my sermon would be, I told her it was “The Real Christian.” I trust the Lord will let me keep in reasonable touch with the subject. However, I would rather the Lord would have His way than mine. A Christian is unique. He stands alone. He supersedes all who have gone before. He will not have a successor. He is man at his best and God’s best effort for mankind. When the conception of a Christian has been established within our spirits as the New Testament establishes the ideal Christian, we will understand then how it is that men have been ready to abandon all else in the world in order to attain Christ, in order to attain His character, in order to become the possessors of His Spirit. I went to South Africa in a most unique time in the nation’s history, just after the reconstruction period following the Boer War. On account of the Great War, the native populace had been frightened practically out of the country. They had gone far back from the war zone, and the war zone covered practically the whole country. The great mines were depending on the natives for labor, and it became a great issue as to how it would be possible to carry on the work while this condition of fear rested upon the natives. Finally, it was proposed that they should bring one hundred thousand men from China. They were brought on a contract for three years. The British government sent a fleet over to China and brought them all out at one time. They were a real living colony. They brought their teachers, preachers, priests, and prophets. Chinese are largely Confucians and Buddhists. At the same period, the East Indian people who live in South Africa (and there are many of them; I think in the Transvaal alone there are two hundred and fifty thousand of them) felt that they were not receiving the attention from the government in the way of education that they ought to, so the British government sent teachers, both religious and secular, to supply them there. So the Buddhist priests, the Yogis, and many others came and made their headquarters at Johannesburg. Our ministry was somewhat unique. We were the only ones who held [meetings] and preached on the subject of healing. After a little time, it dawned on me that here was a possibility that had never come into my life before. If I could get these priests and teachers of the various Eastern religions to come together, we might have an exchange of thought. We would have something accomplished. It would at least give me an opportunity to discuss their beliefs. I was familiar to some extent with the Eastern religions, but I never had any touch with the soul life. So, after some time, the matter was arranged. At the same time, we added to our company a rabbi from Chicago, Dr. Hearst. We had a combination, I presume, representing all the great religions on earth. We were able by wise exchange and guidance and much prayer to finally bring about such a condition of fellowship among these various ones that they spoke out their hearts to each other with a great deal of freedom. Many times we sat from sundown to sunup comparing notes and going over the various teachings, etc. It had such an effect on me that I left that series with this conclusion: There is lots of light in the world, and men are groping after the light. Some possess it in a larger degree than others, but all possess it in some degree. I said to a man as I walked home on the last morning, “One thing surely has been demonstrated, and that is that in Jesus Christ there is a divine life of which, when a man becomes a real possessor, he has a richer appreciation of his power that no other man possesses.” And I have been more of a Christian, of a real Christian, from that day than I ever was before. I am convinced tonight that there is a profound secret in the life, character, teaching, and virtue of Jesus Christ that when a man attains it, he is rich indeed beyond measure. In order to have you appreciate some of the things that I trust the Lord will let me say, I want to relate some incidents. It seems as if I can teach things through incidents that I am not able to teach in any other way. Among my young friends in South Africa were two young men whom I have regarded as the brightest men I have ever known. One was a Boer. His name was Von Shield, the son of an old-line stock of highly educated Hollanders. The other’s name was Kritzmall. He had come from a generation of Church of England preachers. I think his great-grandfather had occupied St. Paul Church in London. I believe he had been baptized there himself. He has always stood out in my mind as a sort of counterpart of St. Paul, for if I can comprehend the character of Paul, I think he was more largely duplicated in that man than in any other I ever knew. These two men were really the only up-to-date “new thought” men I met in Africa. Von Shield was an agent for Christian D. Larson and handled his books in South Africa. He began to attend our meetings and, one day when I was not present, came forward out of the audience and knelt at the altar and sought God for the conscious knowledge of his salvation. And, bless God, he received it. I said, “Brother, do not worry yourself. One of these days, he will come down in the glory and power of God.” I knew what was in that fellow’s heart. And all the time I said, “Here is a newborn soul, just born unto God, whose vision enters into the real realm of God-power.” I realized that my own spirit had not touched the degree of faith that was in his soul, and I thought, I do not want to do a thing, or say one word, that will discourage that soul in the least. Presently, he came back and said, “Brother Lake, come on.” We went and found a young man who had been mad from his birth. He was like a wild animal. He would not wear clothes and would smash himself or anybody else with anything that was given to him. He couldn’t even have a dish to eat on. But in the center of the enclosure where he was, they had a large stone hollowed out, and they would put his food on that and let him eat it just like an animal. Now, beloved, this all sounds strange, I know, but I’ll never forget that afternoon as long as I live. As I looked across to the young man, Von Shield, I could see the lightning flash of faith, and I knew that if he got his hands on the insane child, the devil would come out. Presently, he landed on my side of the bed, and in an instant Von Shield sprang over the bed, laid his hands on his head, and commanded that devil to come out. In two minutes, that lad was absolutely transformed and was a sane young man. The first moment of sanity he ever knew. Sometime later, the family moved to another section of the country, so I have lost track of him. One more incident in the man’s life will help you to realize this thing. Among the Boer people, especially in the Transvaal, they were a pioneer people. They had moved from Cape Colony and lived among the natives there many years. Finally, they succeeded in establishing their own community and later a republic. They did not have the advantages of good schools. In fact, about the time they passed into the hands of the English, education was becoming a real factor. About the only educated person in a community was the Dutch Predicant. He is a real old aristocrat. The firstborn of houses is the Predicant, and everything else likewise. He is the lord of all he surveys and some more. I believe they were people with all authority that the priests of Ireland exercise over the people there. I wanted to leave you with the conception of a Dutch predicant, and then you can understand how a young fellow, unrecognized as a preacher, is situated when he begins to preach the gospel of Christ in a different manner than the predicant. One day, when Von Shield was conducting a service with a couple of hundred people present, the predicant was there. He arose when he was teaching and told the people that they were being misled, etc., and that these things Von Shield was talking about were only calculated for the days of the apostles. The young man, naturally, if he had been an ordinary young man, would have been somewhat nonplussed. But presently he said, “I will tell you how we will settle this thing. There is Miss LeRoux, whom we all know. She is stone blind in one eye and has been so for four years. You come here, and I will lay my hands on you and ask the Lord Jesus to make you well.” And, picking up his Dutch Bible, he said, “And when He does, you will read that chapter,” designating the chapter she was to read. God Almighty met the fellow’s faith. The woman’s eye opened right then, and she stood before that congregation and, covering the good eye, read with the eye that had been blind, the entire chapter. I know her well; I had visited at their home a great many times. Now I will return to the other young man, the most extraordinary incident that I have known in the life of any other human being, unless it was the history of St. Paul when he was on his way to Damascus, when suddenly there shone around about him a light, brighter than the sun, and he says, “When we were all fallen to the earth.” They were probably on horseback. Kratzmall was visiting one night at the home of some friends, a few doors from my home. These young people with whom he was visiting had just recently been baptized in the Spirit themselves, and they were very anxious about this friend and had been praying a great deal about it. This same night he was in the tabernacle, and his friends said, “Come down to our home.” So he went. These two men, Kratzmall and Von Shield, were the highest developed men. I believe Kratzmall was physically the strongest man I ever met. He was an altogether unusual character. And here was a dealing of the Spirit of God such as I have never known with any other individual. And instantly he said, “If You are the Christ, You can do anything You like.” The next moment, the Spirit of God deepened upon him, and he began to speak in tongues by the power of God. Kratzmall, after that anointing, became the most remarkable preacher of the gospel I have ever known anything about. He traveled that country from end to end when he didn’t have a cent. I met him once when he had no shoes and his feet were cut and bleeding. But he established congregations of Christian people for three hundred and fifty miles out through the wilderness. Bless God. Except a man be born again, he cannot see the kingdom of God.…That which is born of the flesh is flesh; and that which is born of the Spirit is spirit. Marvel not that I said unto thee, Ye must be born again. The birth again of God, the conscious incoming of the Spirit of God into the life and being and personality, lifts mankind out of the condition of the professing Christian experience into the place of divine consciousness and power. Then he laid his hands upon them, and they received the Holy Ghost and began to speak with tongues and magnify God and prophesy, etc. The next case is in the tenth chapter of Acts, where the Gentile church was baptized in the Holy Spirit. Finally, in the household of Cornelius, as Peter preached the Word. No altar services there. No laying on of hands. There the Holy Ghost fell on all those who believed. And, to this hour, it is my conviction that the real manner in which the Lord desires to pour out the Spirit in these days is the Spirit simply falling on listening believers. We had mighty few altar services or prayer services, but the power fell upon the people as they sat hearing the Word of God. I have witnessed the Lord baptize fifty people in an ordinary service like this on a Sunday evening. There is a consciousness that seems to me by the Word of God and by my own personal experience to be possessed where any individual can enter into the direct presence of God and receive the baptism of the Spirit. That is the consciousness of sinlessness—the consciousness that your sins are gone. You can classify sin in any way you like. There is this much about it, that in our own inner soul we know that sin is offensive to God, because it is offensive to our own spirit. So, as I said before, the consciousness of sinlessness seems to be God’s requirement for those who would seek the baptism of the Spirit. Indeed, I remember in my own experience when my heart began to be stirred along this line, and I definitely began to seek God for the baptism of the Spirit, that, as the illumination of the purity and holiness of God began to dawn over my soul, instead of going on boldly, there was an inclination to draw back as I realized the awful extreme between my own heart and the heart of God. And I was compelled to cry out, not once but a thousand times, “Lord God, by the divine process of God, cleanse my soul from this condition.” And I remember, bless God, how that one night I was present in a friend’s home. An ordinary meeting was going on, conducted by a little Quaker woman, but she outlined what seemed to me to be the method of cleansing the soul. That night, as I knelt in Fred Bosworth’s home, that consciousness of the cleansing power of Jesus Christ went through my being, and I realized something of what I never realized before: that the battle between my spirit and my soul had ceased and that God reigned, not only in my spirit, but in my flesh, too. The war that had been in my spirit for years was all gone, and I entered into Beulah land. I really felt that I had crossed the Jordan and everything was new. I tell you, beloved, that the external evidences of God and the power of His Spirit, no matter how wonderful, are a small matter compared with the consciousness of the Word of God in the human heart; in your heart and mine, bless God. There is a definite possession of the Spirit of God by which the individual becomes the conscious possessor of the Spirit of God. Indeed, the Word of God puts it in this forceful manner: “Know ye not that your body is the temple of the Holy Ghost which is in you?” (1 Corinthians 6:19). It is God’s purpose, as outlined by Jesus Christ and this Word from cover to cover, that man shall be the conscious possessor of the Spirit of the living God, the Holy Ghost. That is the “real Christian.” That is the thing that has been lacking in the church throughout the centuries past. It was that consciousness of God’s presence and God’s power in the disciples and the church of the first centuries that wrote across the pages of history the wonderful, wonderful record of Christianity of the first four hundred years. There were thirty million Christian martyrs, those who were slaughtered in the Christian wars, etc. Thirty million gave up their lives for the Christ. There was a spirit that made it so intense, so powerful, that had such a power of induction, that the world had to get out. Bless God. But there came a day when the church traded the communion of the Holy Ghost for the smile of the world, and then the long, long night of the middle centuries followed. But, bless God, I tell you we are living in a day and hour when the Spirit of God has come into the world afresh, when the consciousness of mankind is opening up to God in a manner that it has never opened before. There is an awakening in the world from ocean to ocean, from pole to pole, as there never was before. And I believe, bless God, that God Almighty’s outpouring of the Spirit upon all flesh is at hand. And though we are receiving the droppings and our hearts are being warmed under the impulse of the Spirit, the day is not far distant when the flame of God will catch the soul of mankind. And the church of the latter day will close this era with a place of divine glory excelling that of the early church. This is according to the prophecy of the Word: “If the former rain was abundant, shall not the latter rain be more abundant?” (See Deuteronomy 11:14.) Bless God. If the disciples, without the train of Christian history behind them that you and I have, were able to enter into the divine consciousness and power of the Holy Spirit in such a way that they left a stamp upon Christianity, how much more shall men and women who have the advantage of two thousand years of Christian record enter into a diviner consciousness than ever the apostles possessed? The eternal God hath ordained that mankind, being united with Him as one heart and as one soul, shall glorify the Lord Jesus Christ in manifesting His life and character, His person and being. 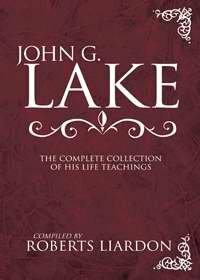 If, then, God’s purpose for mankind is to receive the Christ, shall we not yield ourselves body and soul and spirit to the conscious control of the Spirit of God and let Him manifest Himself in us in humbleness and meekness, bowing lowly at the feet of Him whose we are and whom we serve? Chords that were broke will vibrate once more. Our God, we ask Thee tonight that Thy almighty power shall be upon each soul. That, as we endeavor to yield ourselves to Thee for the conscious cleansing of our nature from sin and its effects, Thy power shall lift us into that consciousness of oneness with God whereby from Thy soul to our own will flow the divine unction of God. That we, being cleansed from sin, may manifest God to mankind, so that the hungry world and dying race and wandering world may be brought back into oneness with God. Amen.